Last week, Oregon Governor John Kitzhaber called for a special legislative session (to begin 8am September 30th) noting that “we have an opportunity to combine cost savings from reforms to the Public Employee Retirement System (PERS) and new revenue to restore lost school days.” In other words, maybe we can remedy some of the draconian cuts made to education in recent years by slashing the pensions of retired teachers and other public workers. Or in other words, let’s pit old people against children. The Oregon Center for Public Policy has noted that the purported revenue gains in the Governor’s package would only last until 2015, and the plan is “mainly a tax cut for some of Oregon’s wealthiest 1 percent.” A spokesman for the governor acknowledged that the real long-term revenue will come from cuts to pensions. This is entirely in line with the findings in a set of reports released last week about the looting of public pensions in states across the US. 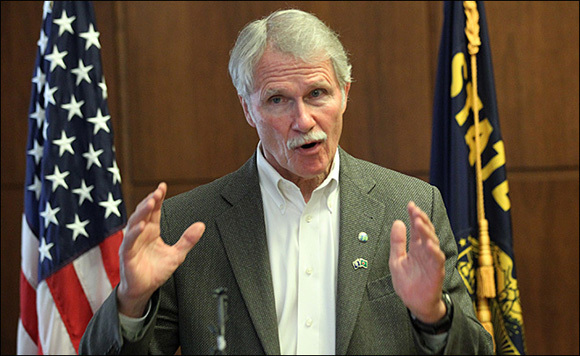 Oregon governor John Kitzhaber. AP Photo. The siege of America’s public-fund money really began nearly 40 years ago, in 1974, when Congress passed the Employee Retirement Income Security Act, or ERISA. In theory, this sweeping regulatory legislation was designed to protect the retirement money of workers with pension plans…But this landmark worker-protection law left open a major loophole: It didn’t cover public pensions. Those portfolios were also weakened by politicians often having failed to meet the Annual Required Contribution (ARC) as mandated by state law. 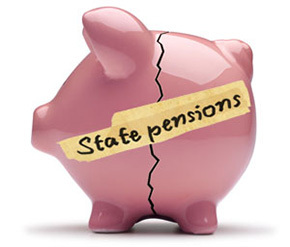 For many state pension funds, a significant percentage of the money is built up by the workers themselves, who pitch in a part of their income, deferring wages or salary in favor of collecting retirement benefits later on. The rest of the fund is made up by taxpayer contributions. But in many cases, politicians illegally borrowed cash from public retirement funds to finance other budget needs. States and cities have for years…used funds that were supposed to go to pensions to instead finance expensive tax cuts and corporate subsidies. That has helped create a real but manageable pension shortfall. Yet, instead of citing such a shortfall as reason to end expensive tax cuts and subsidies, conservative activists and lawmakers are citing it as a reason to slash retiree benefits…and preserve expensive corporate subsidies and tax breaks. The amount states and cities spend on corporate subsidies and so-called tax expenditures is far more than the pension shortfalls they face. Yet, conservative activists and lawmakers are citing the pension shortfalls and not the subsidies as the cause of budget squeezes. They are then claiming that cutting retiree benefits is the solution rather than simply rolling back the more expensive tax breaks and subsidies. Labor activists hold a “budget bake sale” to protest the pension cuts. If, as Marx told us long ago, “The executive of the modern state is but a committee for managing the common affairs of the whole bourgeoisie,” then current events should remind us how small that bourgeois class is. Americans like to think of ourselves as middle-class. But the interlude of progressive taxation and public investments that relatively leveled economic inequalities between World War Two and the 1970s has passed. It becomes increasingly clear today that the interests of the bourgeoisie are the interests of the one percent or less. Yet we can still challenge these actions. 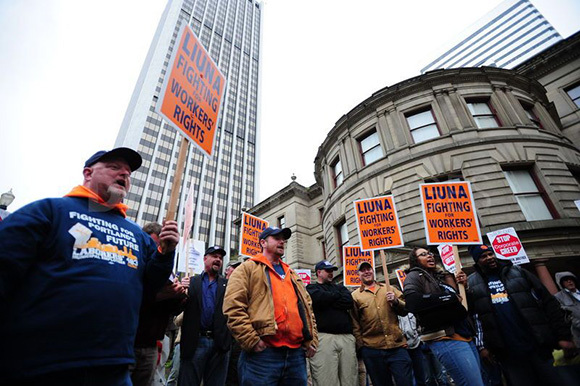 Last week, during public comment on Kitzhaber’s proposals, current and retired public workers and union officials turned out in Salem to protest the cuts to cost of living increases, to describe the human impact of the plan, and to oppose the willingness to violate contractual obligations. It’s not too late to contact your state representatives and let them know if you think the Governor’s Grand Bargain amounts to Grand Theft.